The most popular day trips usually involve visiting another of the islands, e.g. a full day by powerboat to The Exumas to see the famous swimming pigs, or closer to Nassau is Rose Island, home to more of the pigs and a great beach day. Take the ferry to Blue Lagoon Island for dolphin and sea lion experiences, explore by Segway or just laze in a hammock. 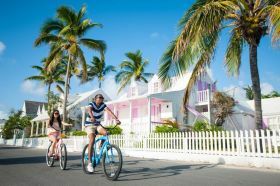 The Bahamas Ferries Harbour Island Day-Away offers a guided tour of picture-perfect Dunmore Town, all day golf cart use and a $20 lunch voucher and, naturally, the famous pink sand beach of Harbour Island. . Now booking through Classic Resorts, info@bahamasferries.com. See Classic Resorts and The Bahamas Tourist Office at Holiday World Show Dublin 25th - 27th Jan 2019.